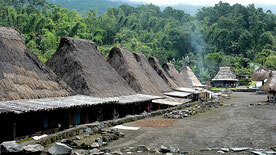 Capital (ibu kota) is Ende which is the second biggest town on the island. 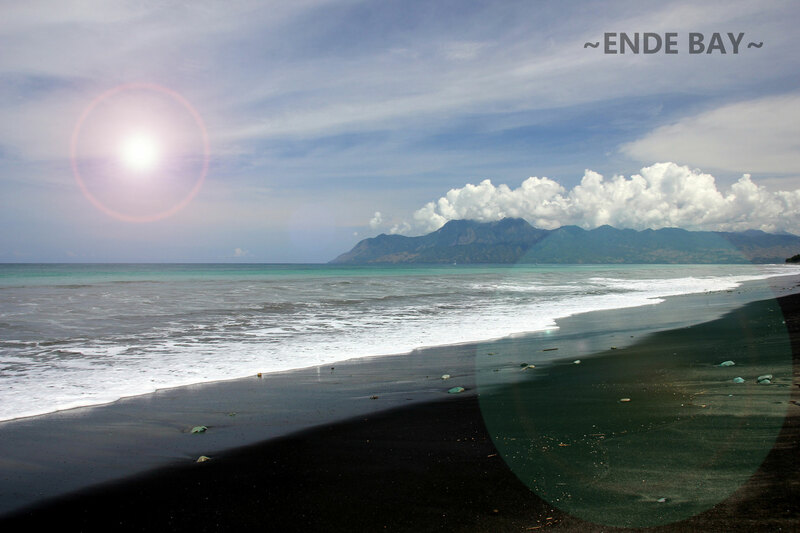 Ende has a nice setting on Ende bay with views over the Sawu Sea (sunset). In front of the bay is Ende Island. 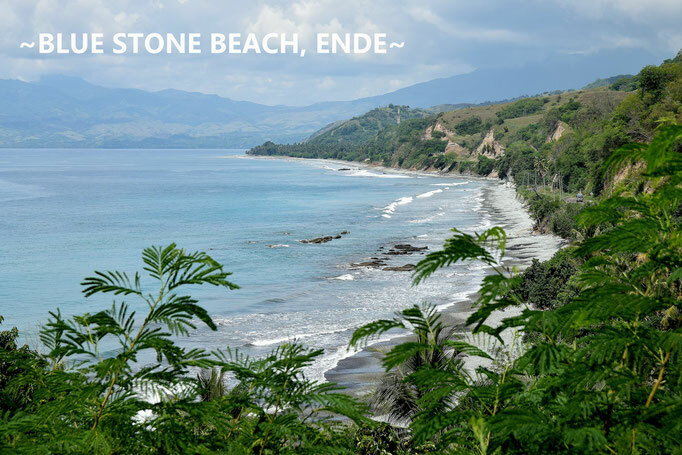 Ende is blessed with plenty of banks, eateries and supermarkets. Here you find the house of Soekarno, once the first president of Indonesia who was banned at that time. Some people choose Ende to start their journey from east to west. 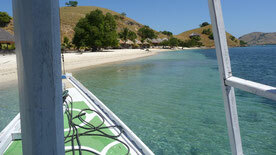 It is more close to Moni/Kelimutu than Maumere although there are more highlights on Flores further east and north. 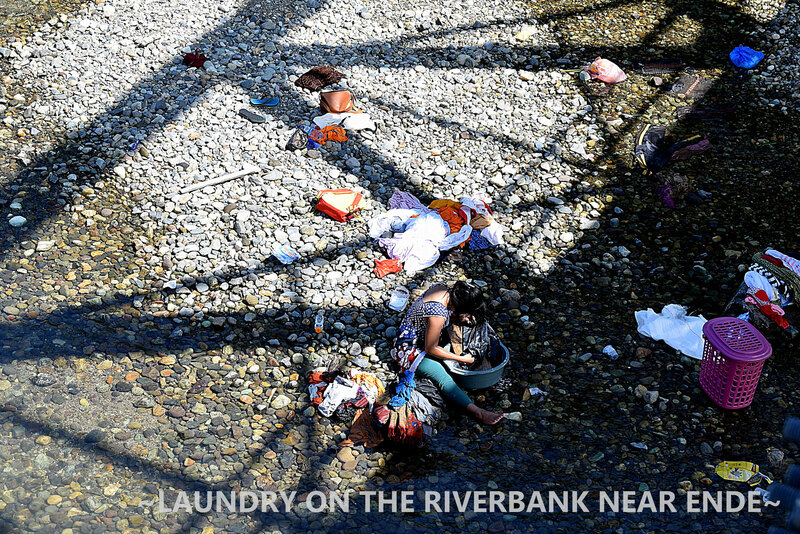 For a city like Ende it has not so much in the way of decent accommodation. Plenty of small restaurants in Ende. A good one is Bangkalan on jalan Achmad Yani, near the airport. There is another Bangkalan on jalan Kelimutu. On the street there are also a few padang restaurants and at the end are some Javanese eateries. Near the beach, at pantai Ria is a stretch with a lot of small warung with cuisines from allover Indonesia and of course ikan bakar, the grilled fish. Ende also has a few decent supermarkets including Hero, Roxy, StarMart and Sinar Mas (most comprehensive). On jalan Kelimutu is a liquor store. Not a lot of choice but at least you can buy local whisky, wodka and wine. There are direct flights to/from Kupang, Labuan Bajo, and Tambolaka (Sumba) and to Denpasar (Bali) with a transit in labuan Bajo or Kupang. The flight Ende-Labuan Bajo-Denpasar goes via the south coast with views on gunung Inerie, Komodo and Rinca and the south of Sumbawa. Ask for a windowseat on the left side of the plane for Ende-Labuan Bajo-Denpasar or on the right side for Denpasar-Ende. 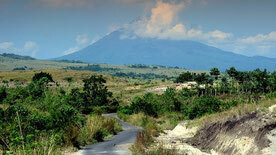 The airport is close to or actually within town and within walking distance of the hotels Safari and Ikhlas. Cars and ojek (motorcycle) await you at the airport. These days the airport also has ther own fixed charter prices. 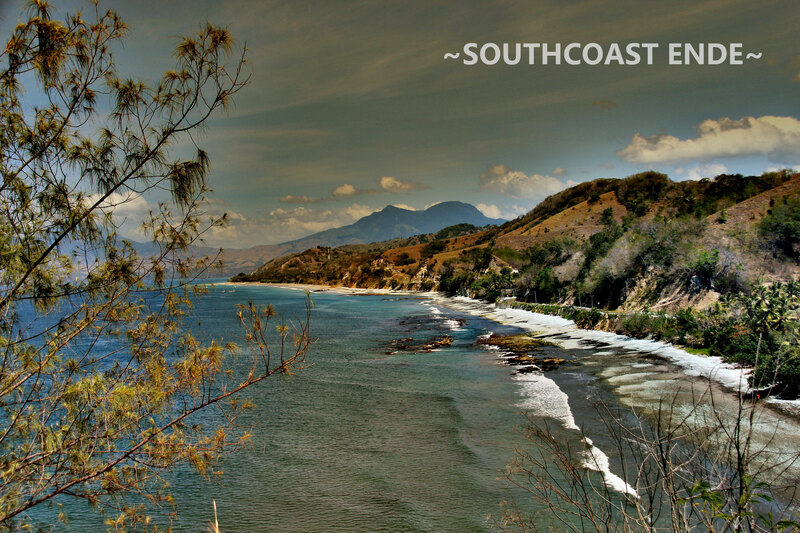 There are buses to Maumere, Larantuka, Mbay, Riung, Bajawa, Ruteng and Labuan Bajo. No fixed schedules, starting early morning. Usually buses stop on their route for some 20 minutes. Rp 10.000 for a ride depending on distance and your negotiation skills. WHERE TO GO OUTSIDE ENDE? The road from Maumere to Ende and especially the Woluwaru - Ende stretch is one of most beautiful parts of Flores, so take your time. Moni is a one street village with fine views over the valley with lots of accommodation and a few nice (tourist) restaurants like Good Moni, Santiago, Rainbow and Mopi's. 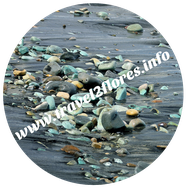 (live music), Moni is around 3 hours from Maumere and 2 hours from Ende by public transport. It is also the startingpoint for your trip to Kelimutu which is 13 kilometers away. Most visitors rush through the village although there are waterfalls, a hot spring and many traditional villages in the area. About 5 kilometers from Moni (in the direction of Ende) the road is dotted with fruitstalls on both sides. 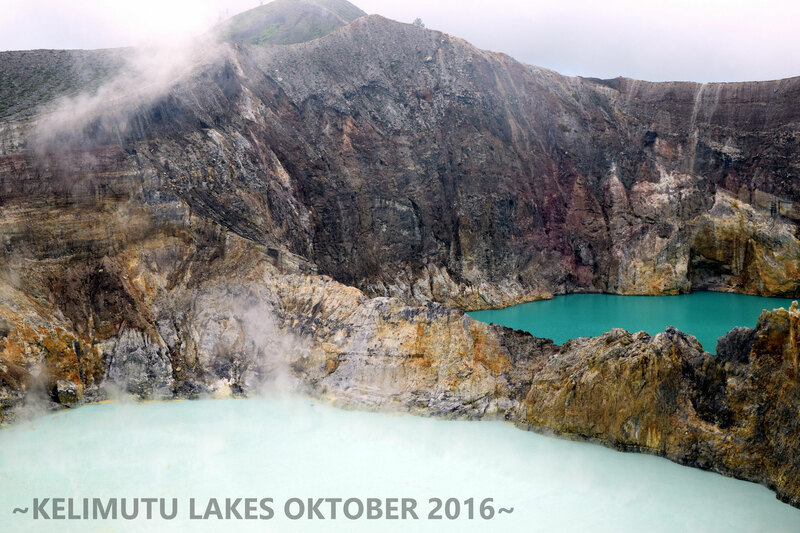 Kelimutu is the name of the volcano and the three coloured lakes and one of the absolute highlights on Flores. The colours of the lakes change from time to time and in the meantime they had many different colours like yellow, red, green, many shades of blue, brown and black. Most travelers visit Kelimutu early morning to see the sunrise (around 5:30 am). Therefore you should leave Moni around 4 am. From the parking it is a 30 minutes walk through the forest. The road from Moni to Kelimutu is been being widened at the moment so it takes a little more time to get to Kelimutu. I visited Kelimutu four times, the last time in October 2018 but I never went there to see the sunrise. If you visit the lakes later on the day, after 9 am or so you will have this wonderful Spielberglike decor almost for yourself. Everytime I was there, there were only a few visitors. After the walk you first see the two biggest lakes (like twins). Later you can climb the stairs as far as the monument to have an overview of all three lakes. Clouds or rain? Just wait untill they are chased by the sun which gives awesome pictures. Enjoy the serenity and nature with a capital N.
Have a ginger coffee or tea or an instant noodlesoup when coming back from the forest. It can be nasty cold up there. The area is also gorgeous for trekkings. Maps are available at the parking. For Kelimutu you can rent a motorcycle at one of the guesthouses in Moni or share a car with other travelers. With your own wheels it's even more comfortable. Sometimes people choose to be taken to the entrance, enjoy the lakes and walk down all the way back to Moni. Take care of good shoes, maybe a sweater, a raincoat en some plastic bags to protect your camera. This cool village is about 45 minutes from Kelimutu and an alternative for Moni. Sometimes people choose to overnight here in the monastry. The scenery here is gorgeous. 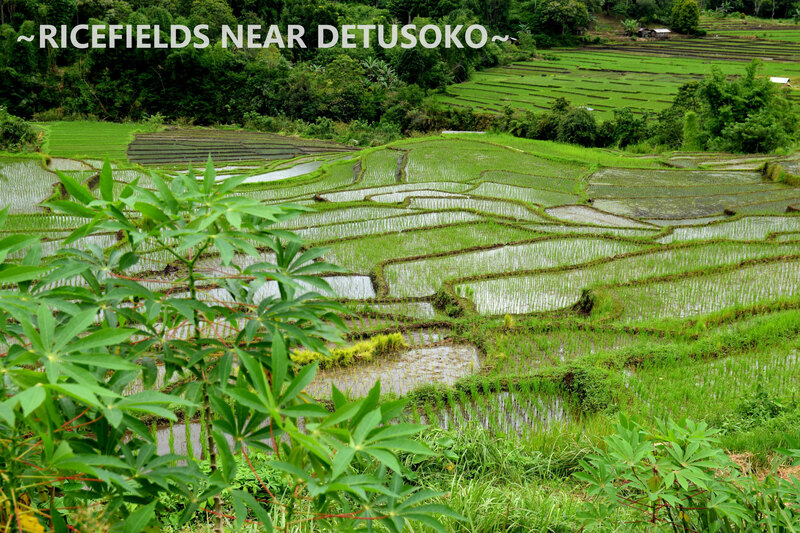 Deep valleys and green mountains, beautiful ricefields en many waterfalls. 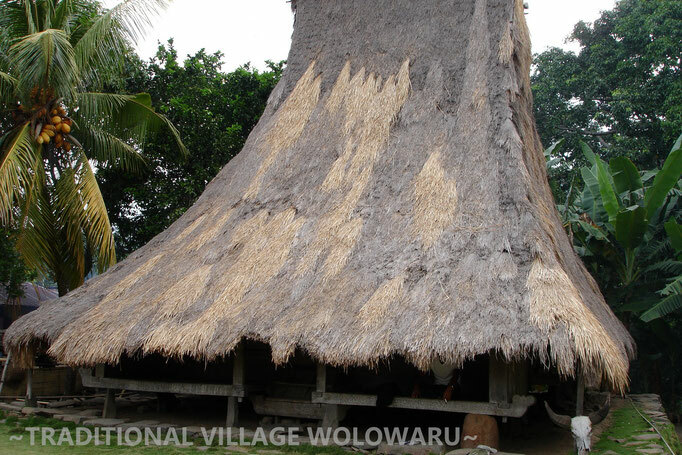 Just before Ende there is the weaving village Ndona. East of Ende there is dramatic coastline and the traditional village of Wolotopo about 45 minutes away. 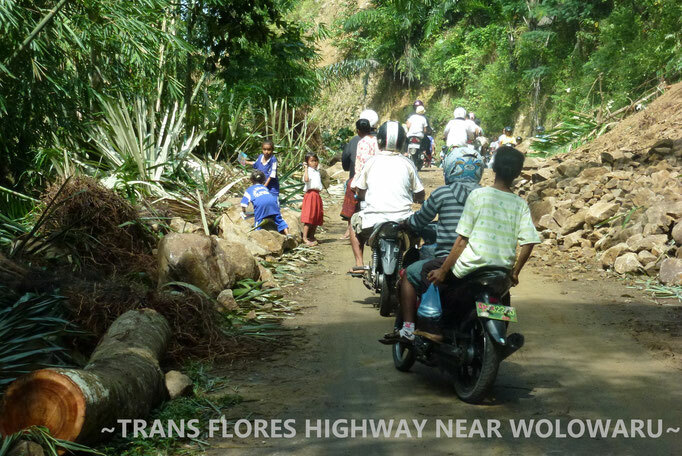 This part of the Trans Flores Road runs along the sea and offers spectacular views as the road twists half of the way. On the left side of the road you will also find some simple places for a coffee break while enjoying the views. On your way to Bajawa or Riung you will pass the blue stone beaches near Nangapanda. 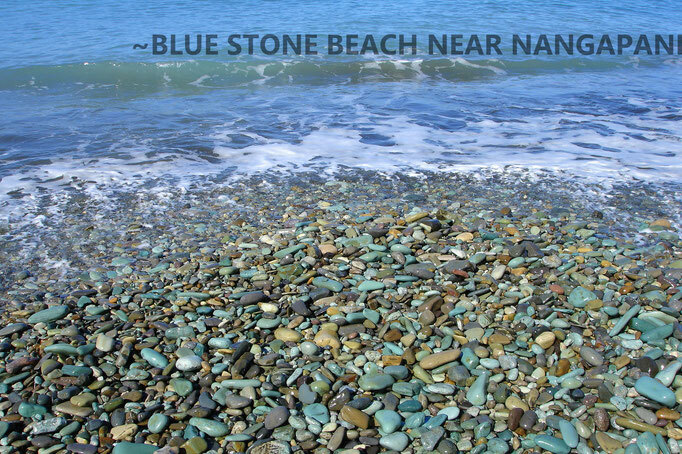 The beach is full of blue, turquoise en green stones which are collected and sorted for export as a base for creative designs for houses and gardens. The stones are an export product for other (wealthy) countries in Asia, like Japan and South Korea but are also exported to Bali and Java. These days the area has become more populair as a lunch stop and there are also a few simple rooms available as an alternative to overnight in Ende.